In general, I'm really digging the whole nose art thing. However, I think "Lybeya Slugger" flows better than trying to spit out "Lybeya Belt Slugger." Just a suggestion. I have simply covered over the pics with white sticker to make a third RGS. That is why I am so impressed. Now, I just got to print that pic out and stick it over what I got now. I have returned with,"The Big Fish." crowd cheers (actually it's crickets chirping) Well I decided to do an Opee Sea Killer, and wanted to do the tongue with a super battle droid getting pulled to an untimely deactivation/doom, but for now I have settled for second best(due to time and skill). So without further delay, and rambling, my latest gunship. The only thing I'd comment about is that the colour variations in the mouth look somewhat weird compared to the plain colours on other areas. Oh I like this one, an awful lot. Mouth looks good to me. Just dont get angry if I do "A Bigger Fish,"
On the subject of the mouth, it was the only way I could get it to come out without looking weird. The use of a limited colour palatte would make the image stand out better and more cartoony. I might try a different shading color, and maybe it will blend better. Whenever I get to it that is. Haha, I look forward to seeing Mark Two of "The Big Fish." Amazon.com finally shipped my Clone Wars Blu-Ray a couple of days ago and I have been freeze framing the movie since picking out the quirky little things Lucasfilm has placed in the background. I managed to spot three new potential artworks to LEGO-fy. Although one is still too grainy to extract - 1080 resolution was still not enough! The pose in the original artwork was ridiculously difficult to get right for a LEGO person, which explains why I have drawn up 2 different leg poses. One that is faithful to the original drawing and the other more feasible for an Orange LEGO Twi'lek girl to strike. Two alternative Lekku positions were also drawn, and I made a set sporting ARC antennas for kicks and as a homage to Lucky Lekku. I am naming this gunship: Happy Flyer. Which one do you think should go onto the final gunship sticker? I think I prefer the Twi'lek with the leg curved inward, the lekku over the breasts, and without the antennae. Just my opinion. I'd go with either A or B, the ones without the antennae. B without the antenna, A, would be fine as well. They are all excellent of course, but imo those two stand out. I agree A or B without the antenna are best. Competition was encouraged among the Clones. The Nubian Sea Knights were known to be a particularly competitive squadron. One gunship, "The Big Fish," took its name after completing a dare which required them to ride on the outside of a Bongo and kill an Opee Sea Killer when they were attacked. However, their squadron mates one-upped them with "The Bigger Fish," after hearing Jedi Master Obi Wan Kenobi retell the story of his Bongo ride under Naboo when a Colo Claw Fish saved him and his master from a particularly nasty Opee. 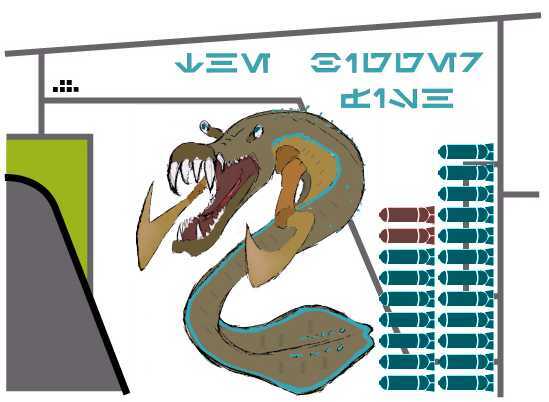 Of course, Obi Wan, ever the trouble-maker, went to a third gunship in the squadron and told them they might be interested in being The Biggest Fish, the fascinating Sando Aqua Monster. That is awesome. I thought the clawfish would make a good nose art, and this indeed is very nice. Terrific back story also. Great job so far though! I like pose D the best. I now I said this a couple posts ago, but THAT! is AWESOME!! That's awesome. Way to bring on the holiday cheer to the Separatists who would be unfortunate enough to encounter that RGS. Personal Gunship of the 6 Null Class ARC Troopers. All the Nulls were named after Mandalorian warriors, and in fact were taught by Kal Skirata, a Mandalorian training sergeant hired by Jango Fett. They were used to heavy action and their gunship clearly showed it had been in a few scrapes. 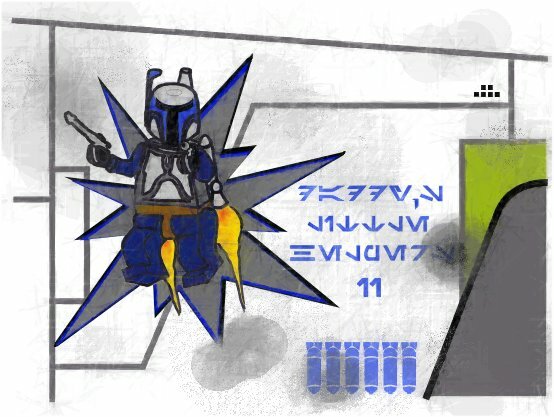 For their nose art, the 6 chose the banner of the ancient Mandalorian Neo-Crusaders, further proof that they saw themselves as not clones, but the new breed of Mandalorian Warriors. which is a beautiful piece of vector art by Trip based on original art by Dustin Weaver, which can be found on Wookieepedia. Wow, that's really interesting! 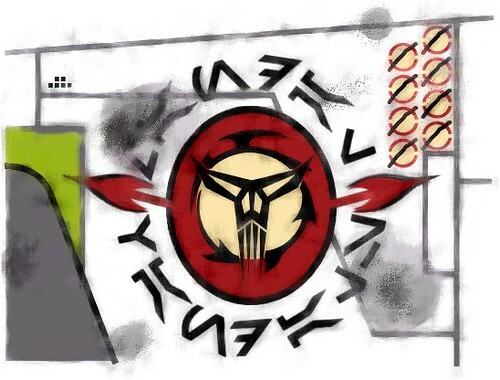 To be honest I didn't know Mandal Motors had an insignia/symbol aside from the traditional Mandalorian skull. They actually do, but this isn't it. The T-Skull is surrounded by the Mando Serpent- the sign of the Mandalorian Neo-Crusaders. The Serpent alone is the sign of the Mandalorian Crusaders. I really don't know jack about them, just linking SW Universe history, and a lot better than George Lucas ever has, if I do say so myself. Incidentally, this:http://images1.wikia.nocookie.net/starwars/images/2/29/MandalMotors.svg, is the Mandal Motors badge. 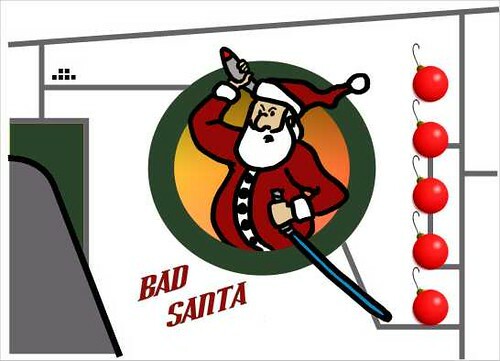 Artistically this is by far your best one, albeit santa was great also. Well I will post the Big fish v.2 this weekend I guess. One question, why have the nulls crossed out the republic symbols on their gunship? @ gold 2: Thanks for that; I've read all four of the RC books so I know pretty much everything about the Nulls. she was killed by Jedi rather than clones. Maybe if anything Kal would start following Order 66 rather than killing the perpetrants of it. OR maybe gold 2 meant to insert the CIS symbol. 1.) We don't have a spoiler tag. Prob'ly should've checked that in a Preview. 2.) Please keep talk about the show in the topic in the Star Wars forum, not in the MOCs forum. "Don't worry sirs, they stand for missions we've completed for your Army. Sgt. A'den is just crossing off missions. If you knew him, you'd see he has a funny sense of humor. Right now, we're all still on the same team..."
The computer artists who implemented the design of the insignia originally intended it to be a generic symbol of the Republic military, which is why it appears on Republic vehicles throughout the galaxy in Revenge of the Sith. A number of expanded universe writers, however, seem either to have only been shown images from the opening battle sequence or to have missed the symbol's appearance on vehicles of other Republic battalions, leading to a continuity discord with the lore regarding the Open Circle Fleet. I'm right, you're not. Now, please everyone, I've learned my lesson not to trampsing around with Expanded Universe stuff. I'd have thought you would have noticed EU writers quite often contradict each other leading to gaps, holes, overlaps, and conflictions. As I don't read much EU, and got all this information from the just as unreliable Wookiepeedia, feel free to blame me on my Flickr, where it has already been begun and not here in this thread, because I like this thread and don't want it locked due to constant bickering over pretty pictures and symbols. The Clones knew full well where they came from. Although most never even met Jango Fett, he was seen as the ultimate warrior and a distant father figure. Daddy's Little Helpers was the original name of this squad's gunship, but after Geonosis, paying tribute to "daddy" was not welcome. The image of Jango was painted over and forgotten. That is until Order 66 was executed, and Jango was revealed to have been fighting on "the right side," from a certain point of view. The original gunship had long since been destroyed, but the squad repainted this one and dubbed it "Daddy's Little Helpers II."